Be close to those who mourn. That’s where Jesus would be. That’s where Jesus is. Let tears fall for the oppressed. That’s why Jesus’ blood fell. That’s where Jesus comforts. Try on the shoes of those who are crushed in spirit; whose burden is heavy and causes them to laboriously take each breath. That’s what Jesus did when He walked this earth, when He felt rejected to His core. That’s why He died on that cross. That’s why He felt those long nails crushing His blood vessels and smashing through His bone as the crowds jeered with no shame at His nakedness and pain. He felt those sensations to prove that He feels for us. He is our teacher, we are supposed to follow in His ways. So, shouldn’t we open the inner sanctuaries of our hearts and be vulnerable enough to feel others’ greatest pains too? Look ahead at another person’s path. See that it is rocky and not level. See the dust that will find its way into that person’s pores and chafe their thighs and cling to their hair. See it all and take that person’s hand anyway. Love well enough to walk with them. Don’t let fear of not having the right words stop you; you might not have to say any words at all. You might just need to grip that brother or sister’s calloused and cracked hand. You might just have to be. To remind them--to remind yourself-- we are not alone. See the body of Christ, made up of so many parts, shaped different ways with different talents. Think of your own body and how it screams when you strangle a finger in the car door! Every part of your body runs to it, your blood dashes to the scene, your nerves light up, all the other parts of you drop everything to scramble to the hurting and focus all of the attention and energy on your finger that throbs and cries out in pain. It doesn’t matter that your finger is small, that you think you could probably do without it if worse comes to worse. It is a part of you, and so your body reacts immediately. The body of Christ needs to be the same way. We need to be willing to listen to the cries of our brothers and sisters, feel their pain, and sit in the uncomfortable struggle with them. We need to run to them, the parts of our body, that are in pain. Sit with the broken. That’s where Jesus is. Be with the mourning, be with Jesus. Draw closer to Him by drawing close to those He comforts. In the comfortable we forget that we need Him. And that even there, He is our sustainer. In the uncomfortable or in the pain, even if it belongs to someone else, we remember that Jesus is what we need. 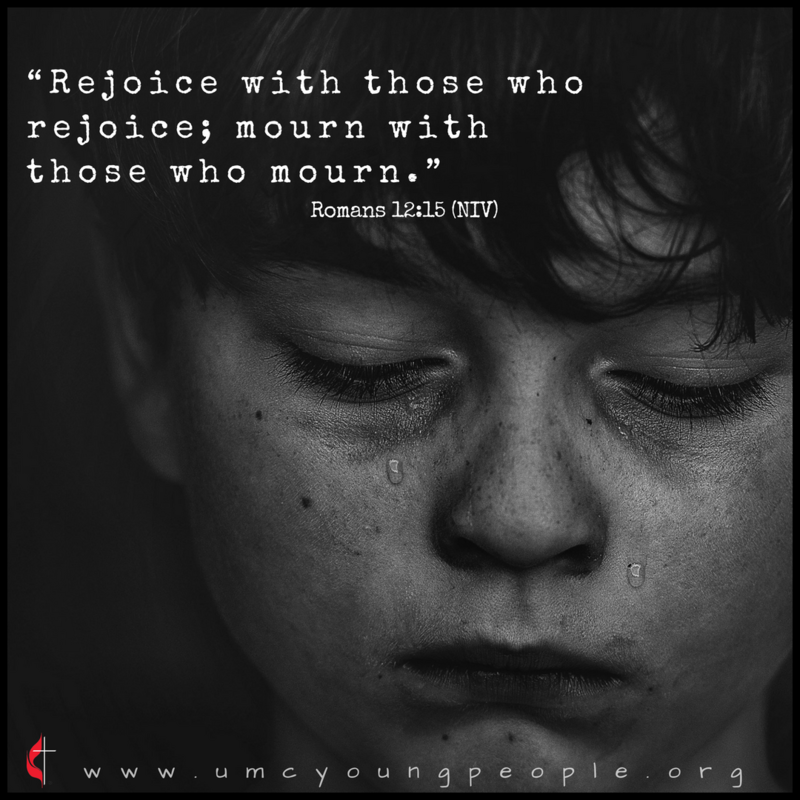 Mourn with those who mourn because Jesus did and calls us to follow, because it makes the body stronger. That is how we can make sure that we are putting ourselves in places to meet Jesus. Who do you feel the Holy Spirit nudging you to walk alongside with? How could putting yourself right in the midst of the lives of people who are struggling help both you and the other person? Have you ever seen God use someone else to comfort and help you through a hard time? Do you need to change your habits or reach out of your comfort zone to be purposeful about spending time with people who need a friend? What could that look like for you today?